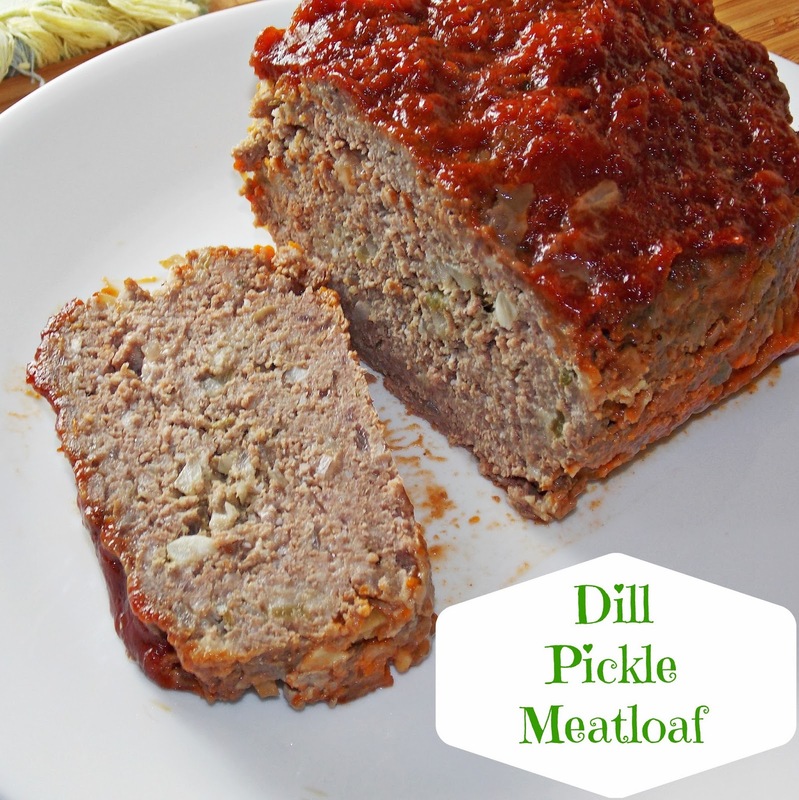 This recipe for Dill Pickle Meatloaf is like having one big hamburger in a pan! The flavors from the pickle and the juice are combined with the meat and glazing (optional) and baked to meaty perfection! The leftovers are delicious in a sandwich spread thin with a little mayonnaise and something I look forward to every time I make this recipe. The first time Grumpy ever told me he wanted me to make Dill Pickle Meatloaf I thought he was crazy. I also didn’t have a clue that anyone even made such a thing. Well, if you know me, then you know that I set out to find what it was about so I could make him his request. I did a little searching and I found a recipe on Allrecipes.com for Dill Pickle Meatloaf. 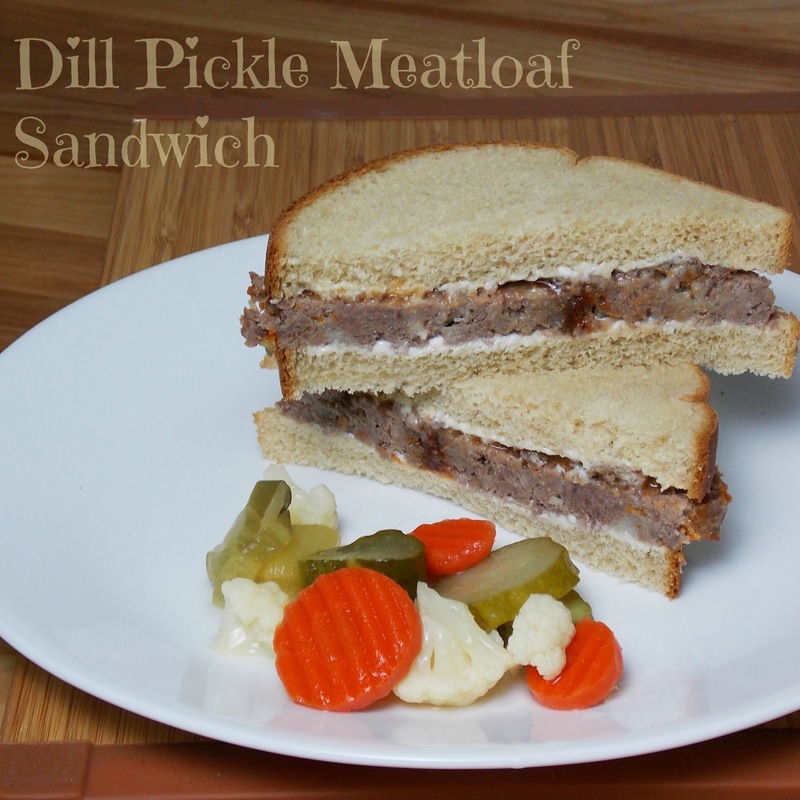 I’ve been making this recipe now for several years and I can’t imagine meatloaf without the dill pickles in it. Especially if I am using my dad and mom’s home canned dill pickles! What is the best part of making meatloaf? Well, in my opinion, it is the meatloaf sandwich you can have for lunch the next day! Something about that sweet/sour combination of the pickles, ketchup topping and a little bit of mayo between two pieces of bread is just mouthwatering. I’m wishing I had one for lunch today! Preheat an oven to 350 degrees F. Spray a 8×8 inch baking dish or loaf pan with cooking spray. Crumble ground meat into a large. Place the egg, onion, pickle juice, chopped pickles, salt, and pepper and bread crumbs in the same bowl. Mix together (I use my hands) until evenly combined. Form into a loaf and place into the prepared pan. Stir together the ketchup, water, sugar, and Worcestershire sauce; pour over the meatloaf. Bake in the preheated oven until no longer pink in the center, about 1 hour. An instant-read thermometer inserted into the center should read at least 160 degrees F.
Optional use of dill pickle in the glaze – Chop one dill pickle and add to glaze topping with 1 tablespoon dill pickle juice prior to adding the glaze to meatloaf. This sounds amazing. I'm a dill pickle fiend. Don't even talk about sweet pickles around me. I think they should be illegal. It is addicting 🙂 Can't wait for you to make it either! this looks and sounds so good Shelby! Pinning! This sounds yummy. We put grated dill pickles on our homemade tacos, everyone thinks it's nuts they try it. This sounds interesting. I had never heard of it either. Made it tonight (with a few tweaks (; )…can't wait to taste! My family loves meatloaf for breakfast. I’ve been preparing it for many years and have tried many ‘meatloaf’ recipes. This is one of the very best. I double it. I use two pounds of ground beef and one pound of pork sausage. Thank you for submitting this recipe. Shelby, Greetings from Manitoba, Canada. I’ve made this recipe numerous times, and it’s become the only meatloaf recipe I use now. We love the pickle flavour in it, and it still has the ketchup topping that I’ve always used. Thanks for an amazing recipe. So delicious! I turned the leftovers from last night’s dinner into a sandwich for lunch today! I’m excited to have it again today, thanks for sharing!